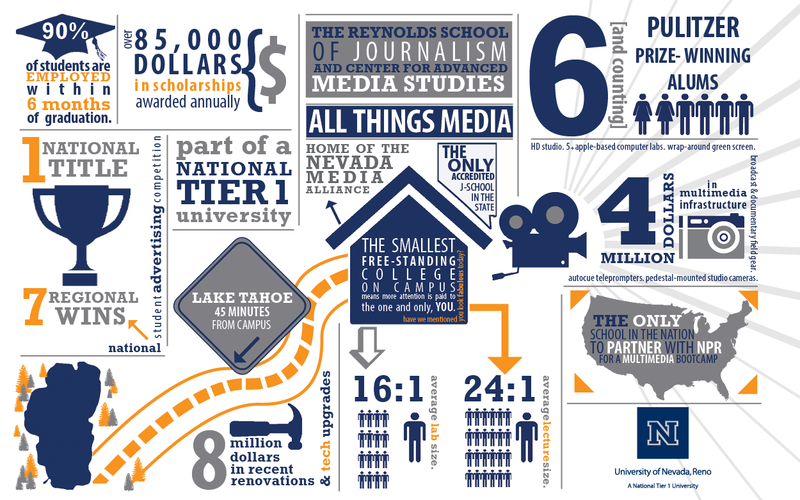 The Reynolds School of Journalism, a dynamic and growing program with great momentum and a spirit of collegiality, seeks new faculty members to contribute to its team, as well as teach and mentor our promising students, beginning in Fall 2015. The Reynolds School is developing a national reputation for innovative curricula, an emphasis on experiential and entrepreneurial learning, and strong support for faculty research through our Center for Advanced Media Studies. The scenic University of Nevada, Reno campus, in sight of the Sierra Nevada mountains, is located 45 minutes from Lake Tahoe and four hours from San Francisco and the Napa-Sonoma wine country. The Reno/Tahoe area is a recreational paradise, close to world-class skiing and snowboarding, kayaking, hiking and bicycling. Reno is home to an emerging technology sector, with a vibrant arts and restaurant scene. To learn more about the available faculty positions available with the Reynolds School please see the individual job description with links to the University Human Resources website below. Our new colleague will be tenureable, and will teach and conduct research in one of our curricular areas: news or strategic communications. Research agendas in engagement, audience analysis, diversity, and data are especially valued. The successful candidate will have a developed program of scholarship, commensurate with the tenure requirements of the University of Nevada, Reno, as well as administrative experience or demonstrated potential to serve in a leadership role in the Reynolds School. Experience in working with graduate programs is a plus. Our new colleague will teach undergraduate and graduate courses at the nexus of journalism, data and computer science, and conduct research with the strong support of our Center for Advanced Media Studies. This position aligns with Nevada’s emergent emphasis in computational research and education. The successful candidate will have a doctorate in hand by fall 2015, related professional experience, and demonstrated potential for a program of scholarship in line with the tenure expectations of a research university. Expertise in information graphics and data visualization is valued, as is the ability to teach reporting. Our new colleague will teach undergraduate and graduate courses related to communication law and policy, as well as other courses depending on background and experience, and conduct research with the strong support of our Center for Advanced Media Studies. The communication law class is required of all Reynolds School students, reflecting our commitment to study of the First Amendment and its evolution in the face of technological and industrial change. The successful candidate will have a doctorate in hand by fall 2015, and demonstrated potential for a program of scholarship in line with the tenure expectations of a research university. The ability to teach media history is a plus. Our new colleague will teach in our integrated advertising and public relations curriculum, and conduct research with the strong support of our Center for Advanced Media Studies. The success of our NSAC and Bateman teams has earned our program a national reputation, and our students have developed innovative campaigns for major clients. The successful candidate will have a doctorate in hand by fall 2015, related professional experience, and demonstrated potential for a program of scholarship in line with the tenure expectations of a research university.